Nacho seasoning mix that comes pre-packaged in an envelope or spice jar at the grocery store is inexpensive and convenient, but can contain a lot of unnecessary sodium and sometimes even sugar. Fortunately, it’s not difficult or complicated to make your own nacho spice mix at home. 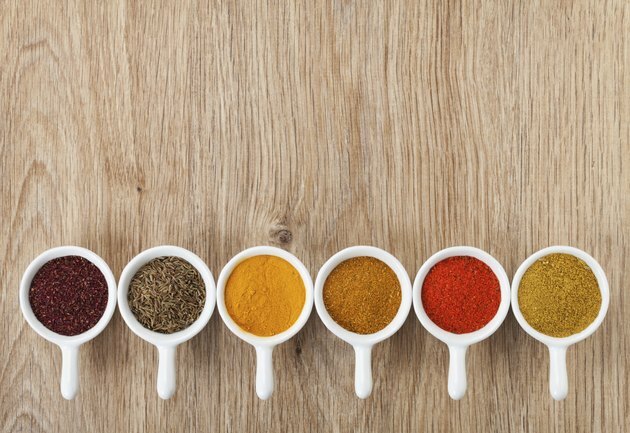 Mexican seasoning mix can be flavorful without being overly spicy, and making it yourself means that you can turn the heat up or keep it as mild as you choose. Pour equal amounts of chili powder and onion flakes into a small bowl. Around ½ cup each is good to make enough nacho seasoning mix to last for awhile. Chili powder is flavorful, but not necessarily hot, so don’t confuse it with red pepper. If you don’t like the texture of onion flakes, substitute onion powder and reduce the amount to about 2 tbsp. Add 4 tbsp. each of cilantro and garlic flakes to the bowl. The measurements don’t have to be exact, because everyone’s taste is different. Don’t be afraid to experiment. Put approximately 2 tbsp. each of cumin and thyme into the bowl and mix everything well with a fork. Transfer the contents of the bowl to a jar with a lid to keep your nacho seasoning mix fresh. Add a tiny bit of red pepper or chili flakes to your nacho seasoning for a little extra spiciness. Do not use a lot of chili flakes or red pepper in dishes served to small children. What Can I Use as a Substitute for Cayenne Powder in Cooking?